Company says organisations with existing environmental sensors can now use its software’s DCIM-class capacity planning and simulation capabilities. EkkoSense is opening up its SaaS-powered 3D visualisation and optimisation software with support for 433MHz wireless temperature sensors. The UK-based data centre thermal optimisation specialist says organisations that have already installed third party wireless environmental sensors will now be able to benefit from its thermal optimisation 3D simulation and analysis capabilities. It also claims that they will benefit from DCIM-class capacity planning and simulation functionality. The SaaS-enabled EkkoSoft Critical 4.1 solution is said to be based on “rigorous” thermal and power management engineering principles and provides data centre managers with true real-time visibility of their critical heartbeat operational data. 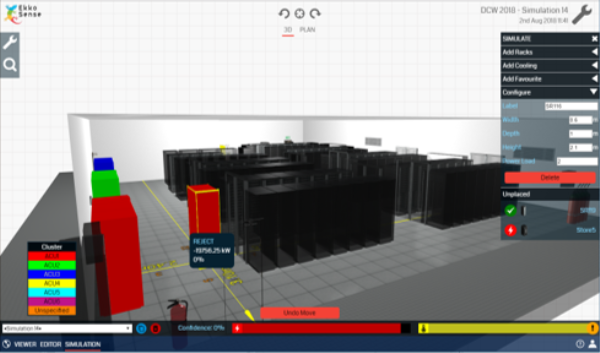 EkkoSense says the latest release features advanced 3D simulation capabilities that equip data centre teams with the ability to experiment safely with rack, power and cooling layouts to deliver optimal M&E configurations. The company claims its software’s “comprehensive” capacity planning and simulation capabilities combine to enable data centre operators to improve the real-time management of the cooling, power and space aspects of their data centre capacity. It says this helps to identify potential problems earlier that could threaten IT availability. EkkoSense continues by saying organisations can use EkkoSoft Critical 4.1 to see exactly where and how they’re currently under- or over-cooling their data centre estate. It reckons this translates directly to significant energy savings, with customers already achieving an average 25-30 per cent reduction on their data centre cooling costs. According to EkkoSense sales director Jason Kaye, the company is “disrupting” the traditional cost for data centre thermal management with its “ultra-low cost” Critical Things family of wireless sensors. He says the company sees the need for granular levels of data centre thermal measurement, but also acknowledges that there are many operators and colo service providers that have already invested in 433MHz wireless sensor networks. “We want to make sure that they too can take advantage of EkkoSoft Critical’s powerful thermal optimisation capabilities,” says Kaye. “EkkoSense is all about providing DCIM-class functionality at a fraction of the cost of traditional complex DCIM suites or CFD consultancy approaches. Kaye says adding support for third party environmental sensors is an important first step in expanding the EkkoSense ecosystem, particularly as the company develops its proposition for the critical colo sector.